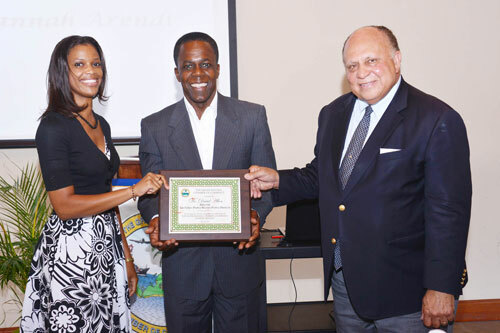 Freeport, Grand Bahama - Grand Bahama Chamber members were in for a shock at the last Monthly Luncheon Meeting when Dr. David Allen, of Nassau, presented many statistics about crime in our country. He gave a dramatic and heartfelt presentation about the recurring roots of crime and his steps toward preventing crimes. he also had many recommendations for the Government including using the Defense Force to assist the police, curfews and national service, among other things. he also gave details about his The Family Program, which has received international acclaim He will shortly be working on his project and subsequent paper called the Allen DeSocialization Assessment Tool. Dr. Allen, along with his assistant, Keva Bethel, also told of plans for Grand Bahama with their The Family People Helping People Program, to be coordinated with Urban Renewal. Also at the GB Chamber of Commerce meeting, Mr. Carey Leonard of Callenders & Co., and also counsel for the GB Chamber of Commerce, gave an update as to the progress of the Judicial Review currently before the course. The Chamber of Commerce and some of its members are asking cor clarification of some of the fees and taxes that were implemented July 1, 2013 through the Customs management Act. Their claim is that some of the new items implemented are taxes and therefore contravene the nature of the Hawksbill Creek Agreement, under which all businesses in the Freeport area operate. Dr. Allen is well regarded in the international medical community. He trained in medicine at Saint Andrew’s University, in Scotland, UK and in Psychiatry and Public Health at Harvard University, in Boston, U.S.A. Certified by the American Board of Psychiatry with Added Qualification in Addiction. 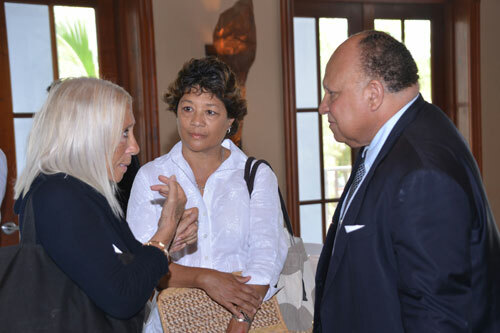 He has taught at Harvard, Yale and held a clinical professorship in Psychiatry at Georgetown Medical School, in Washington, U.S.A.
Dr. Allen has pioneered the development of treatment approaches to cocaine addiction in the Bahamas and Washington, D.C.
Chamber members and guests also heard that the Self Leadership program, held recently under the direction of Mrs. Billie Bowe, 2nd Vice President of the Chamber, was quite successful and that several new courses will be introduced shortly for the summer. For more information about these programs contact Mercynth Ferguson, Executive Director of the Grand Bahama Chamber of Commerce at 352-8329.